Freshii, the leading global healthy eating fast food restaurant chain is opening in Galway on Monday creating 10 new full time and part time jobs. Located in the heart of Galway City on Lower Cross Street, Freshii will offer a delicious and diverse menu including salads, hot bowls, burritos, healthy wraps, soups, fresh pressed juices, smoothies and frozen yogurt, that energise people on the go, served in an eco-friendly environment. Freshii is at the forefront of the global health and wellness movement, pioneering the new “healthy fast food” category. The company’s goal is to bring healthy food to the masses with convenience and affordability. Freshii’s diverse menu is meticulously developed and continues to be evolved by their culinary experts and certified nutritionists and caters to a wide range of dietary preferences includingvegetarian, vegan, gluten free, dairy free and wheat free. 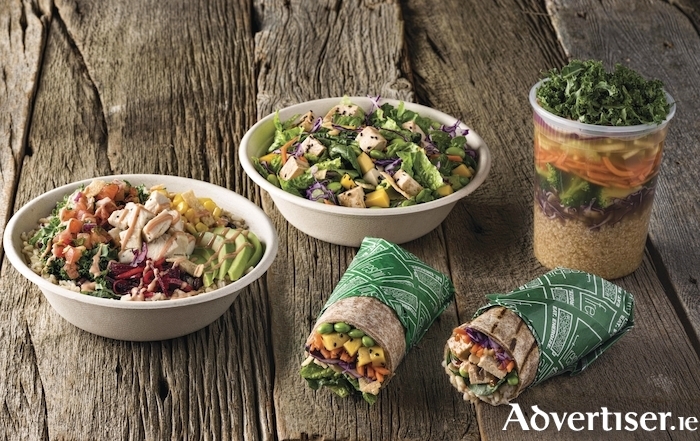 Freshii meal choices are based on fibre-rich, slow-burning carbs, essential fats and lean proteins. Freshii’s menu includes tossed salads with homemade salad dressings made fresh daily, tasty hot bowls with brown rice or quinoa, burritos, healthy wraps, soups, fresh pressed juices, smoothies, frozen yogurt and breakfast, all of which can be customised with flavourful combinations from 70+ high quality and colourful ingredients. In addition to healthy meals, Freshii’s broad menu offers snacks that energise customers throughout the day and the menu is also supplemented by seasonal and innovative offerings. Freshii Ireland Master Franchise Holders Dave O’Donoghue and Cormac Manning are thrilled to be opening in Galway. Healthy food fans may already be familiar Freshii in Applegreen’s Enfield Motorway Services on the M4 westbound, as well as their two Applegreen outlets on the M1 at Lusk (north and southbound ). Freshii also has a number of restaurants in Dublin – Mespil Road, Dublin 4; CHQ Building -Dublin 1; Point Square -Dublin 1; Smithfield - Dublin 7; Dame Street – Dublin 2, Central Park Leopardstown – Dublin 18, Rathcoole -Co Dublin and Sandyford Industrial Estate – Dublin 18. Each Freshii restaurant has its own look and feel to fit within the community while offering the same fresh, high-quality ingredients and menu countrywide. Freshii recently announced that they are implementing the biggest initiative by any fast food restaurant chain as it plans to become Ireland’s greenest fast food business. Freshii is committed to protecting the environment by introducing a fully compostable range of food containers, cups and cutlery in all its Irish restaurants. Almost every Freshii food container a customer eats from will be fully compostable, degrading into the earth in just six to eight weeks with only organic matter left behind. The new forks, spoons, knives and straws are also made from eco-friendly plant starches which decompose quickly leaving no trace metals behind and Freshii will provide compost bins in store so that every item can be disposed of correctly. Page generated in 0.1340 seconds.